I checked in at the dedicated First Class/oneworld Emerald check-in zone at JFK, bags were checked through to my connecting Etihad flight. With boarding passes in hand I headed through security and to the American 'Flagship Lounge'. Access to this lounge was granted through my oneworld Emerald membership with Qantas. 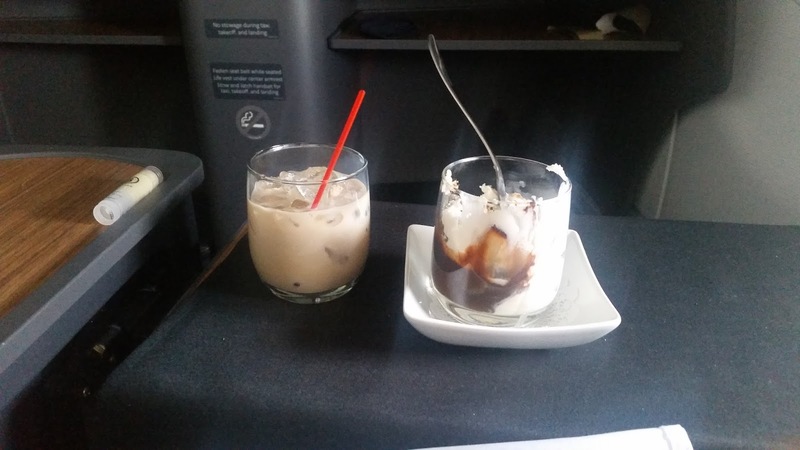 The food selection was basic but sufficient, about all you would expect from a lounge in the USA (even if it is considered a 'Flagship' lounge). There was a selection of both hot and cold breakfast options and a good range of drinks. The lounge seating was comfortable and had some great views. It would have been quite peaceful had it not been for a very loud American woman talking to her elderly father at the top of her lungs, continuously! Wifi was available free of charge. Eventually it was time to head to the gate for the 11am scheduled departure time. I had picked this flight to ensure I would get a proper lunch service on board, all the earlier flights only serve breakfast. As I headed to the gate a fire alarm started sounding.... I was concerned we would have to evacuate! Boarding was paused temporarily, but soon enough the alarm stopped and boarding commenced once more. My friend and I occupied 6D and 6F for this flight, the aisle and window on the right hand side. The seats are set at a slight angle and feature large 15.4 inch HD screens for the entertainment system. The seats are an attractive gray colour with leather headrests. Menu's, amenity kits, and BOSE headsets were found at every seat along with a packaged large pillow and blanket. I was happy with my seats but it is worth noting that the galley and a lavatory are located just in front, so you may wish to sit a little further back if you want to steer clear of those areas. I have to say I was very impressed with both the drinks list and the menu, a good selection all round. Pre departure Prosecco in a plastic cup! I played around with the AVOD system and seat controls. Both were easy to use and I found the seat very comfortable in the lounging position. The selection of movies and TV shows was extensive, and there was paid for onboard WIFI if you wanted it too. Drink orders were taken and I got a glass of chardonnay, served in a stemless (I still dislike those) wine glass, along with some warmed nuts in a bowl (yes!!). I was pretty happy with my meal, it was quite tasty. Getting more wine was no problem either. For dessert there's a choice of fruits and cheeses, or the famous ice cream sundae! I had the sundae (cream, nuts, hot fudge please), and my companion had the cheese. I had a generous serving of Bailey's on ice to go with it. Very tasty! With lunch over I reclined my seat and continued watching The Second Best Exotic Marigold Hotel on the IFE system. The crew set up a self serve basket of snacks at the front of the cabin on one side, and on the other a basket of fresh fruit. Very handy if you felt hungry anytime during the flight! It had been a long week so I put my seat into flat bed mode, cuddled up with my blanket and pillow and slept a solid 3 hours! The seat was very comfortable and among the best around the world for a domestic flight. Perhaps only Qantas can beat it at the moment with the refurbished A330 serving Perth transcontinental flights in Australia. A few minutes later we were on the ground in sunny Los Angeles, a full 38 minutes early. I was pleased as it meant I had time to go to 'In n Out' burger during my transit! I was incredibly impressed with this sector. Flying with the USA legacy carriers can be very hit and miss (probably more miss most of the time) - but I have to say this flight was wonderful. Good food, amazing seat, decent wines and service was quite pleasant too. 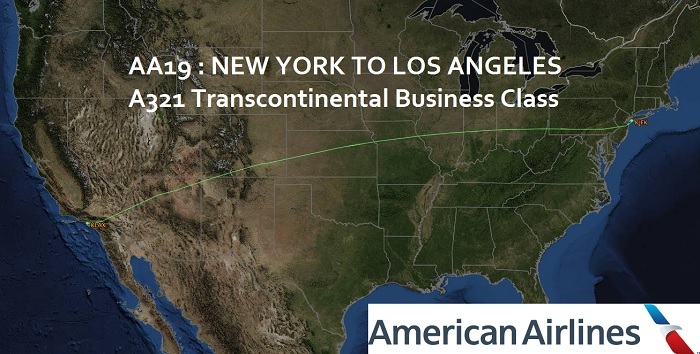 I would definitely recommend AA business class from JFK to the West Coast, a great way to get around. I hope to try out the First Class cabin sometime in the future.